I'm a food TV junkie. The best part of watching the shows is when they air a really delicious looking recipe and you have all the ingredients in the house! So when The Next Food Network Star had a recipe for Sweet Corn Mac n Cheese, I knew I had to make it...and I had to include some sort of pork product. As The Boy says, "Bacon makes everything better!" And because the corn was hidden with cheese, The Boy didn't have a problem eating it. I opted to skip making homemade croutons. That's 5 minutes of work I don't mind skipping in favor of panko. In a saucepan, simmer the corn with the milk for 5 minutes. Combine the cornstarch with about 2 tablespoons water and stir well. Add the cornstarch to the corn mixture and whisk over medium heat for 3 minutes. Season the corn cream with a little nutmeg, salt, pepper and hot sauce if using. Remove from the heat, cover and keep warm. Boil the elbow macaroni in full rolling salted water for 4 to 6 minutes. Drain the macaroni well and add to the corn cream. Add the Cheddar, half of the mozzarella and the egg. Mix in the chopped ham. Stir well. Pour into a 4-cup casserole dish or 12-inch cast-iron skillet and top with the remaining mozzarella. Cook on the top rack until golden, 15 to 20 minutes. YUM! I have to make this. It looks great and I know my kids would like it too. Thanks for linking up at Doodles & Stitches. This sounds really good. Thanks for sharing the recipe. I am drooling this looks sooooooo good. I would love it if you could share this wonderful post at our WIW linky party. I hope you can join us. 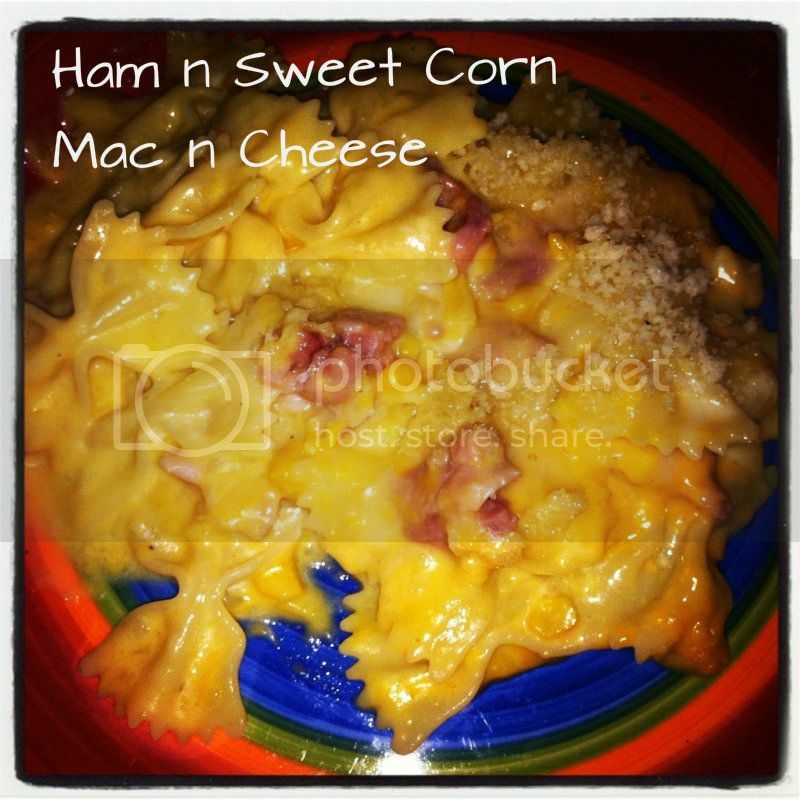 This sounds sooo good - and the ham was a good call. Thanks for sharing on Busy Monday! Stopping over from pin the tail on the bloggy (I'm next to you with the link that didn't show up!) to pin the mac.